Caption slip reads: "Photographer: Richardson. Date: 1951-10-16. Reporter: Swaim. Assignment: Cinderella contest, Pasadena. 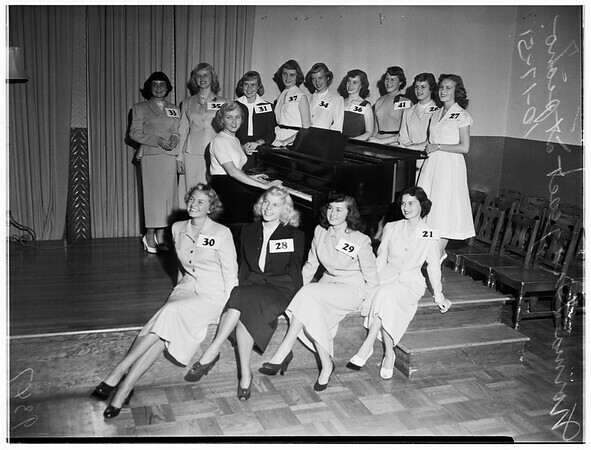 K1, 2: Norma Drageset, 1951 Rose Princess, playing 'Golden Slippers' for 16 of 20 finalists in 'Cinderella' contest conducted by Rose Princesses Association. K7, 8: Norma Drageset at piano and remaining 13 of 29 finalists. Cinderella, to be announced Sunday, will reign over charity ball to be given Oct. 27 by Rose Princesses Association".